The inspiration for RCAD 352 came from an adorable napkin that I received in a rack from my dear, sweet friend Myra who is "craftyrats" on You Tube. I use a Raisin Boat Stamp for the Dear Santa from the set called "Dear Santa" and an old die cut for the ink bottle. Here is the process video for you to see how this RCAD came together. Thanks for stopping by and I hope you have a wonderful crafty day. Fun with the gold background and that adorable kitten. Ihave so enjoyed seeing all the cards you have made with bits and bobs. i am going on Friday to add a cat to our home, I am so excited. Soooooo cute! LOVING that kitty!!!!!! 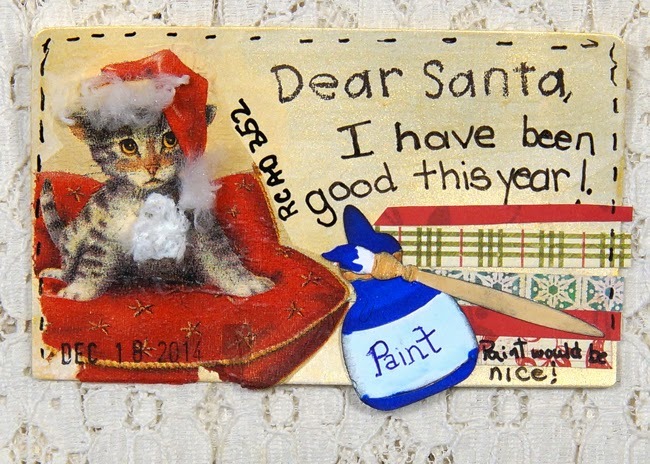 Linda you must have read my mind I have been wondering if you were going to make a card with a kitty on it and here one is and what a terrific one it is I love it.